Always pleased as punch whenever I see ladylike silhouettes taking center stage during the myriad of fashion weeks and I was not disappointed this season by the slew of full-skirted confections that sashayed down the runways at every turn. I can't think of anything more ladylike than a gorgeous full skirt skimming past the knee and highlighting a shapely calf (usually one of the narrowest parts of the body and often the least shown off)? 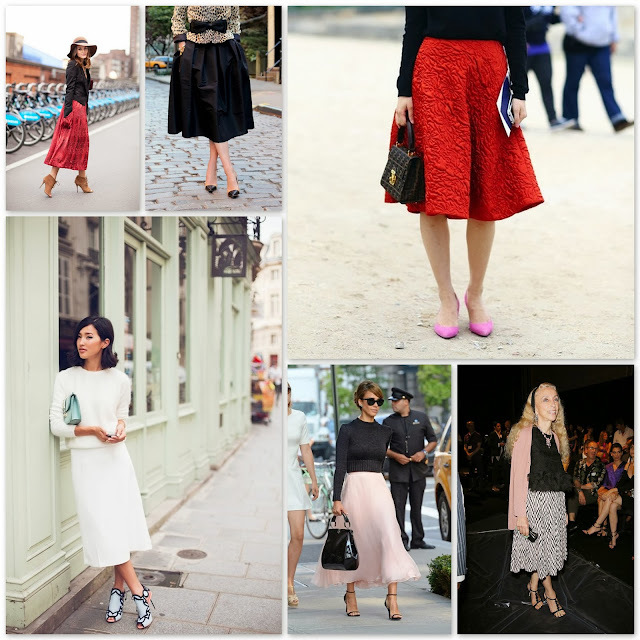 As a major skirt fan, in my humble opinion one can never get enough of the freedom a full skirt allows the appendages and that extra touch of chic your gait takes on when you are more aware of that freedom. Almost as simple as the quick one-two step into a fabulous frock, the skirt started to lose its popularity a few years back in favour of the pant but I have always wondered what made the pant any easier to slip on than the skirt??? Paired with flats, heels or any heel height in between, that same top you would pair with any measly pair of pants would work with a full skirt. Now for those of us who will swear that the full skirt is not for them due to 'perceived' girth and/or lack of height, I am here to tell you the full skirt will work on anyone. Finding the right full skirt (or any item really) comes down to complimenting your body with the right dimensions. Vanishing waistline the problem? Stay away from bulky sweaters, crops and waist-grazing tops, tuck in your chosen piece, and belt, belt, belt! Not blessed with the legs of a gazelle and body of a goddess? Join the rest of us and get to know what length and width dimensions work for you by trying on a variety of skirts until you chisel down the options to one that suits you to a tee and avoid flats. Cold weather climate giving you the chill? Pair your skirt with opaque tights and boots, if Mother Nature calls for it. Tall and lanky? God bless you and go to town with any full silhouette that strikes your fancy! At a towering 5' 1, I take extra care when I come across something fuller, be it top or bottom, that might overwhelm my lack of stature, making me look a lot wider than I actually am so I look for the proper proportions of width vs. length. The key is the shorter you are, the less fullness you need. What is your take on the full skirt? A 'must have' or not so much? Personally, I love them, as all that width gives me the illusion of a wasp waist. I adore them too, easiest way to give you the perfect hourglass silhouette! There are few items I love more than a good full skirt–and boy do they make your waist look lovely! I adore full skirts! A-line: the most forgiving style ever. I LOVE THIS TREND! .. I just did a post a styled a few of the skirts. Check my blog out.